Natalie giving a spining demo! Alicia and Natalie are feeling guilty for not making the program a priority. Help inspire them as well as other listeners by joining their KAL by using #masterstatus. Natalie and Lish plan to finish blocking swatches 1-8. They need to knit swatch 9 and 10. They will also need to begin their questions! Alicia is still plugging along on the Sock Recipe: A good, plain sock by Stephanie Pearl-McPhee and using Knit Picks Stroll Solids, Heathers and Twists in the Blue Yonder colorway.She also cast on Fontainebleau Lace Scarf by Joan Hughes knit with Seed Lace from The Fiber Seedin a flamingo colorway. She was sent this kit as a same from the Fiber Seed. She also has a Baby Bear Hat for Newborn or Preemie byJennifer Dickerson on the needles. Natalie had to buy a new needle for the stocking. She picked up a needle from Hobby Lobby by Yarnology. She cast on A NEW Family Portrait - A Collection of Three Christmas Stockings byDorene Delaney Giordano pattern and Cascade 220 Sport in Burgundy and Buff. She also cast on cast on a new toe up sock in theGrey Brown Marl Patons Kroy Sock.She worked on some spinning while at the Grand Opening of Stash - A Place for Yarn. She found a bag with a single bobbin mostly full and the rest of the roving all pre-prepped. It’s Long Dog Handspun a division of Sunshine Knit Designs in the Panda base which is 60% Superwash Merino, 30% bamboo, 10% nylon. (20:08) If you are planning on joining us in the Harry Potter Knit/Crochet House Cup, be sure to head over to sorting! She finally knit up her first real hand dyed hard. She knit a plain garter stitch infinity scarf usingClara fromKraemer Yarns. Natalie finished up her toe up socks in Patons Kroy Sock in the Blue Stripped Ragg colorway. They actually fit her this time! She cast on 14 sts for toe, increased to 72, decreased 4 after a couple inches and then did an after thought heel. Natalie modeling her awesome Blue Stripe Ragg Kroy Socks. Spread the Love:(27:18) The winner’s are Marianne S. who wins the Thive Handcrafts Lavender Silk Soap with real tussah silk fiber and lavender essential oil and Kristine B. who wins Woodsy Lavender with Frankincense, Cedarwood, & Clove. 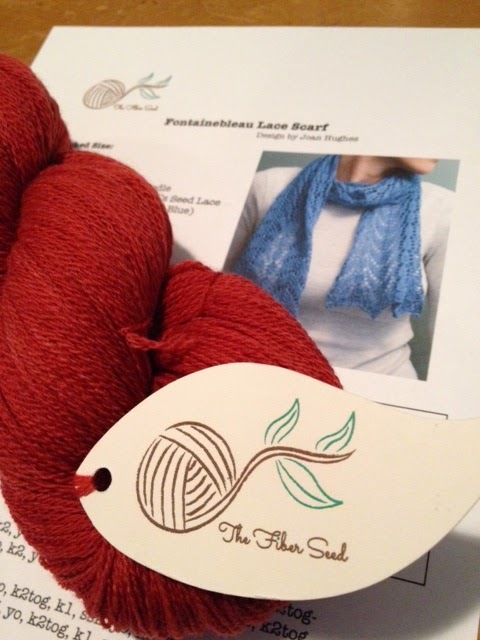 Our next giveway will be an awesome prize from The Fiber Seed a local to Natalie company. Alicia will be reviewing the prize next episode and we’ll announce the winner in 2 episodes...giving you plenty of time to enter. You can enter a chance to win a pattern: Fontainebleau Lace Scarf by Joan Hughes knit with Seed Lace from The Fiber Seedin a country apple color way. Thank you to The Fiber Seed for the awesome give away! For now you will want to check out their site at TheFiberseed.com and see if your local yarn store is carrying them. Alicia is selling off wedding items and preparing for the new school year. She has been assigned a new school and is excited for the new adventure. She is busy making items to sell at festival end of the month and is prepping for the 3rd Annual Hand Made Music Extravaganza! She caught her hair on fire at her cousin’s bachelorette luncheon. She also abandoned ship on the “no-poo” hair routine. This week we ask: What kind of projects do you gravitate towards during a stressful time in your life? Natalie enjoys knitting vanilla socks...the simplier the better. It’s like her mind is full and can’t focus on concentrating on a pattern but she needs the stress relief of knitting. Alicia likes to knit socks but something with a pattern to give her mind a break from what is stressing her. If she goes too simple, my mind will race on what’s bothering me. Alicia was treated to homemade cinnamon rolls from her cousin. Natalie has been enduging in the show Outlander! Thank you for joining us for episode 9 of Mastering the Knits. You can email us at masteringtheknits@gmail.comand follow us on Twitter @mtknits. Alicia is knottyknitter17 on Ravelry, Twitter, Instagram, Natalie can be found on twitter, Instagram, plurk, everlapse, and ravelry as barknknit. They have some amazing colours - all so pretty. If you push me I would have to say Hemlock. Thank you. Definitely hazel. For some reason it's just calling to me. French Mallow for me. Rich! I think I'm in love with Hemlock but all the colors are lovely.